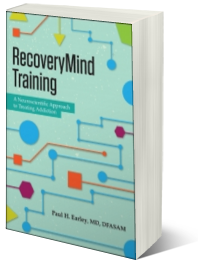 We are proud to announce the release of RecoveryMind Training - A Neuroscientific Approach to Treating Addiction. In describing the book, Dr. Earley said, “This book was decades in the making, it emerged out of a deep-seated conviction that addiction is a brain disease that produces wholesale changes in drives, intent, self-control, learning memory and even one’s world view. The text took 4 years to write, but the ideas have percolating around in my head for years.” RecoveryMind Training combines the latest brain science with effective psychotherapy techniques and twelve-step philosophy. This information is collected into a cohesive treatment system with clear realizable goals. The central tenet of the book states that when an individual develops addiction, the illness hijacks existing brain circuits for its own purpose. The collection of all of these changes in brain functioning is called AddictBrain. To develop a robust and long lasting recovery, someone who is afflicted needs to retrain his or her mind. This sum of all needed retraining is called RecoveryMind. 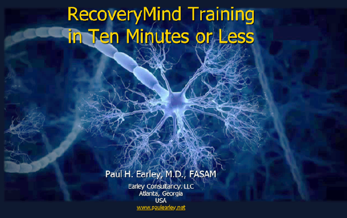 To get to RecoveryMind, we use RecoveryMind Training. AddictBrain and RecoveryMind are radical concepts. They may strike you as exaggerated or even disturbing. The treatment concepts described in this text are aimed at individuals who suffer from a significant, progressive addiction disorder. Experience has shown that once such an individual develops a serious substance or process addiction, any attempt for a gentler approach minimizes the severity of the situation and prolongs agony. A less radical approach may eventually prove to be lethal. The AddictBrain concept and its corresponding RecoveryMind care system produce sustained results. Learn more about RecoveryMind training by clicking here. You may purchase the book by clicking here. Read what others are saying about RecoveryMind Training by clicking here. To watch a short video about RecoveryMind Training, click on the image above.